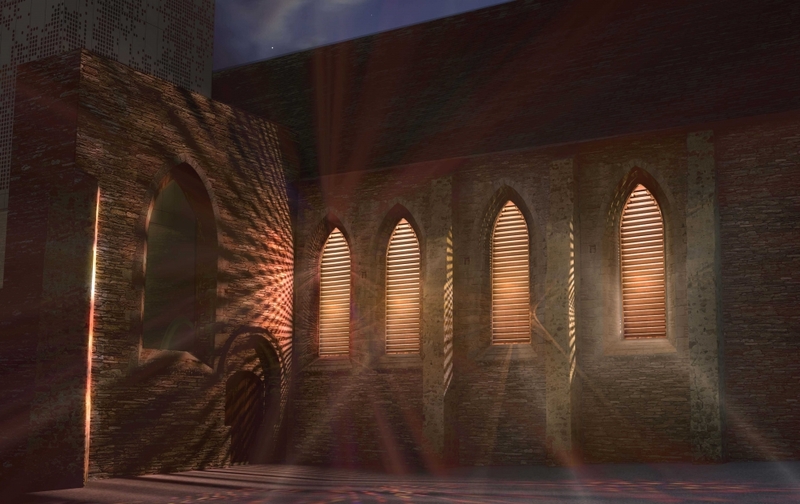 For the Couvent des Jacobins, integrated into the construction of the new Congress Center by the architect Jean Guervilly, Laurent Grasso thought of an artwork installed in the framework of the original bay windows of the convent. In keeping with other large-scale projects created for the public space (Du Soleil dans la Nuit, 2012; Solar Wind, 2016), Revolving History questions the ways artworks appear within the city. A few months after his latest solo show at the Perrotin gallery, the artist proposes a new visual enigma, which, for the first time, will feature permanently. Each bay window is equipped with twentyseven brass-plated triangular prisms, namely one hundred and eight modules. These modules, integrated into the ribs of the former stained glass windows, are rotating in a synchronized manner. The movement of their mirror-like golden surfaces reflects the exterior and interior surroundings alternatively, in the same way that it magnifies that of the sun’s path and the variations of ambient light. The slow rotation, which always involves a glare or an irradiation, produces a feeling of hypnotic strangeness. Referring to the Dreamachines of Brion Gysin, art historian Arnauld Pierre reminds that this is a recurring motif in the working method of Laurent Grasso who “organizes focal points of attention, which constitutes one of the first conditions for a descent into hypnosis”. The slow and consistent motion of the prisms suggests an activity, thereby inventing the fiction of an actual operation. Together they form an unidentifiable object, which remains visible from afar through its radiation, arousing curiosity yet refusing to provide a definitive answer regarding the aim of their presence. The use of brass echoes an interest for the aesthetic of scientific machines and instruments, from the Renaissance to the nineteenth century (microscopes, sextants, theodolites, Tesla’s antenna), which the artist often revisited or transformed into sculptural objects in order to question their fictional promise or the enigma of their function.